Among the many congratulatory notes we’ve received recently, was one from ex-Summerhill GM, Anton Procter, a highly successful breeder in his own right in more recent times. His note and our response tells it all, and reminds us of where we’ve come from, what we stand for and were we’re hoping to go to. I know this is a bit belated but just to say well done again on being the best breeders in South Africa. Your other great achievement is to have Northern Guest as the champ broodmare sire. Not bad for a stud that had to sell firewood to pay the wages in the early days. Proc, many thanks for your congratulatory note. It’s especially welcome, coming from you and Judy, and many thanks for the reminder about the firewood. You were here throughout the formative years of Northern Guest’s career, and you will no doubt recall us tuning in to the BBC (for which you had the only signal in the district!) to listen to El Gran Senor’s Dewhurst and Derby runs. His achievement of 8 Broodmare Sires titles (7 in a row) is apparently without precedent (according to Ada vd Bent) and I have little doubt that a good deal of the success we’ve enjoyed of late, is attributable to the foundations we laid together in those days, and the very considerable luck that came our way in the form of Northern Guest. We need to take ourselves back to 1983, to a little known farm in the Midlands which was just beginning to shake its limbs trying desperately to make its mark. There wasn’t much to speak of at Summerhill in those days, other than lots of enthusiasm, plenty perspiration, and some daunting challenges. 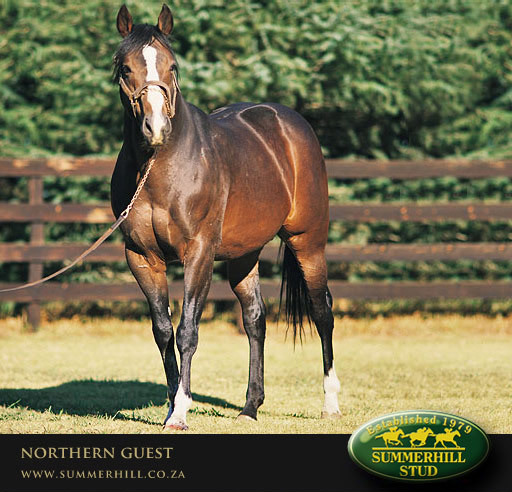 One of those was the acquisition of a stallion, and the story of Northern Guest is one of the great sagas not only of our history, but in the pantheons of South African stallions. Obscure in so many respects on his arrival, including the fact that he was half-crippled and unraced, Northern Guest nonetheless bought one of the great pedigrees of the world to Mooi River, and he proceeded to anoint himself as the king not only of our district, but of the country as a whole. He single-handedly reshaped the commercial stallion environment, and while we would’ve managed him very differently had we known then what we know now, he did what he did despite the judgement. This was a man who could rise above life’s obstacles, establishing himself as the treasured genetic prize of his time. While several attempts to buy him from abroad were foiled by a variety of interventions, including in the case of a Japanese offer, the imposition of sanctions by their government on South Africa, Northern Guest left an indelible legacy on the affairs of breeding, not only at his home farm, but across the sub-continent. While the monetary rewards of those offers were never to manifest themselves in the hands of his investors, in a sense we were otherwise lucky, and that was that he remained at Summerhill until his death at 25 in 2002. Our good fortune came in the form of his daughters, and the evidence lies in his eighth Broodmare Sires title last Friday, his seventh in a row. According to the European Bloodstock News, which covered this milestone in their Friday edition, his record in this department is without precedent in the annals of South African breeding, and it leaves him only one short of the greatest American Broodmare sire of all-time, Mr. Prospector. At face value, ranking in the league of Mr. Prospector is worthy enough, but we shouldn’t forget that in all of southern hemisphere history, there was never a more successful son of the greatest stallion of them all, Northern Dancer. Yes, if you examine the facts, and you look at Australia, New Zealand, Argentina, Brazil, Chile or anywhere else in the southern hemisphere, there’s no son of Northern Dancer with his mark more pronounced on the affairs of the turf, than Northern Guest. Look around you at Summerhill, and especially at the edifices which were erected during his tenure, and you won’t find a windowpane, a pebble in the tarmac or a piece of roof sheeting that he didn’t contribute to, and it’s probably fair to say that in the mares that travelled to his court from far and wide, he sustained a new generation of farms in our vicinity. He had the capacity to create employment in an area that desperately needed it to a degree few human beings have achieved. As we did in those days when he passed the farm office on his way to his paddock, we’re all standing with our caps in our hands, remembering that in this fellow, we were properly blessed. A Great Grandsire Northern GuestThe Breeder’s Championship was not the sole cause celebre on the property however. The season’s end also saw the chalking up of another record for a past member of our team in the Broodmare Sire’s Championship. To refer to Northern Guest simply as a “member” however, seriously downplays the spectacular role this star stallion played (and plays) in the affairs of this farm. If there ever was an idol here, he was it. Six Gr1 Wins by Northern Guest’s Senor SantaAs an active stallion, he produced no fewer than 16 Grade One winners, he won numerous Championships at both the General Sires and Juvenile Sires levels, he was by some distance, to the point of his era, the most successful commercial stallion in history, and there’s not much on this farm today that he hasn’t left his mark on. Securing a record sixth consecutive Broodmare Sires title then, whilst not entirely surprising, is another milestone in the path paved in gold, and it’s at times like this, when Summerhill itself is the beneficiary of its third consecutive Premiership, that we remember the contribution of this man and his daughters. No wonder we all used to bow when he passed by the Farm office in the mornings on his way to the paddock, people always remember him. Today, that sacred patch is occupied by another horse worthy of the title: Muhtafal.